Memphis Police officers stationed at Airways precinct responded to a report of a shooting at 10 p.m. Tuesday, April 9, 2019 in the 1500 block of Cella Street, near Deadrick Avenue in the Orange Mound neighborhood. When they arrived officers located a white Jeep Cherokee and inside they found gunshot victim Justin Borta. He was pronounced dead on the scene by Memphis Fire Dept. personnel. Anyone with information about this killing is asked to contact CrimeStoppers, 528-CASH (2274). Memphis Police officers from the Crump Avenue precinct responded to reports of a shooting in the 800 block of Springdale Run just north of Jackson Avenue at 12:40 a.m. on Wednesday, February 27. On arrival the officers found a male victim on the ground suffering from gunshot wounds. The man was pronounced dead on the scene by responding paramedics. Surveillance footage at the scene showed two male blacks ran south from the scene and got into an older model (possibly 2004) silver Chevrolet Impala already occupied by another male. The Impala fled the scene and was last seen in the area of Jackson Avenue and Eva Street. Anyone who can help identify the one or more involved in this homicide is asked to contact CrimeStoppers, (901) 528-CASH (2274). Memphis Police officers from the North Main station were dispatched to the intersection of Alabama Avenue and Danny Thomas Blvd., just north of downtown, to check out a report of a shooting at 7:49 p.m. Wednesday, February 27, 2019. Officers arrived to find two gunshot victims inside a Chevrolet Monte Carlo. One man was pronounced dead at the scene and the second died later at the hospital. Names are not being released at this time. Information gathered on the scene showed that suspects had fired multiple shots at the victims from a black vehicle that fled the scene. Anyone with information about this double homicide is asked to contact CrimeStoppers, (901) 528-CASH (2274). Officers with the Memphis Police Department’s Special Traffic Investigation Squad responded to a hit-and-run pedestrian fatality at 11:34 a.m. on August 29, 2018. The accident occurred near the intersection of Lamar and American Way, in front of a Loves Truck Stop facility. 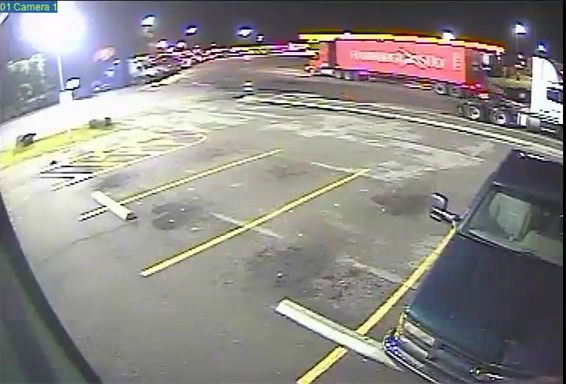 A red tractor trailer rig (see image) was turning into the truck stop when it struck pedestrian Marsha Deberry. The impact made her fall under the truck’s wheels. Memphis Fire Department personnel were called to the scene where they pronounced Deberry dead. The 18-wheeler, with red tractor and trailer and the words “Hamburg Sud” on the side, left the scene of the accident without stopping. Anyone with information on this fatal hit-and-run case is asked to contact CrimeStoppers at (901) 528-CASH (2274). Officers from the Raines Precinct were flagged down by a pedestrian at 12:34 a.m. Sunday, February 10, 2019 near E. Brooks and Millbranch roads, south of I-240, south leg. The officers quickly discovered Cameo Covington, sitting in the driver’s seat of a vehicle and unresponsive. He was suffering from apparent gunshot wounds. Memphis Fire Dept. personnel arrived and pronounced Covington dead on the scene. No other details were available to police. Anyone with information about this homicide is asked to contact CrimeStoppers anonymously, (901) 274-CASH (2274). View this week’s Most Wanted Fugitives. If you have any information about the fugitives shown, contact CrimeStoppers. Awards over and above regular CrimeStoppers awards are sometimes offered by individuals and groups to help solve cases. Click here to view cases with extra awards. If you know who is responsible for any of these crimes or if you have any information that might be helpful to law enforcement officials, please call CrimeStoppers at 901-528-CASH. You will be given a secret ID number and your identification will remain completely anonymous. You also can submit a tip anonymously via secure texting or webmail. To find out how, go here.